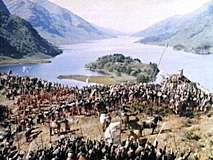 The "raising of the standard" scenes in Bonnie Prince Charlie were filmed very close to the spot where this event in Scottish history actually took place on 19th August 1745. The filming location was on the hill above the Glenfinnan Visitor Centre looking down Loch Shiel. 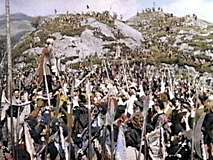 These scenes from Bonnie Prince Charlie were re-used in the later production of The Master of Ballantrae.